Why is office space planning so important and what benefits can it bring? Homepage Knowledge Centre Why is office space planning important? Why is office space planning important? When we begin a new project with clients, there is often a lot of excitement around how the new workspace can look, however, the aesthetic appearance of the space is just one element that needs to be considered. Second only to staff salaries, your property rent or mortgage is likely one of the highest costs to your business, so it’s essential that your space is planned carefully if it’s going to work as hard as your people do. Here at Penketh Group our space planning service ensures that sufficient time is taken to understand the needs of your company; how and where you work, and what your people need. This ensure that we present you with workspace plans and ideas, that perfectly meet the requirements of your people and business. Here are just some of the benefits our customers have experienced following our space planning and refurbishment service. As your company continues to grow and space becomes increasing tight, relocating to a larger space can seem like the only realistic solution, but this simply isn’t the case. Through our thorough space planning procedure, we are able to analyse current working habits and discover any wasted or less economic spaces within the building. We can put this space to better use, avoiding the need for expensive office moves and increased property payments. Space efficiency isn’t the only benefit to come from a carefully designed workspace. By understanding how and where your people work, we can create a variety of workspaces, designed to suit the working styles around your company. We call this the ‘eco-system’ and it describes an assortment of workspaces all working together, providing choice and control to employees. And, this is important as the most highly engaged employees are those that have the freedom to choose how and where they work. 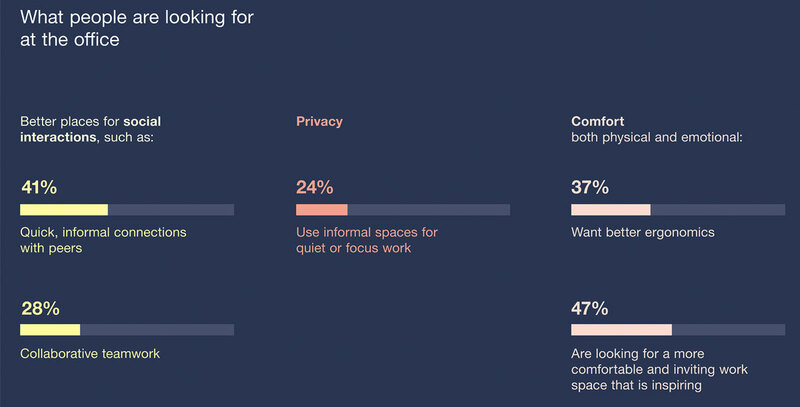 In a recently survey conducted by Steelcase, workers were asked about the spaces they would like to see….53% said that they can’t find the right type of spaces that they need. Statistics such as this are not uncommon and can have a real effect on employee engagement and productivity in the workplace. Involving workers in the design process can go some way to helping engagement levels, not only will employees feel involved and valued in the process, but it also ensures that the spaces created are reflective of the work taking place. You may think that if a workspace looks attractive and inviting that it will be a effect workspace, however often we see that employees need for integrated technology hasn’t been considered, or that they simply can’t power up their laptop in a private or focused meeting space. We recently completed a workplace project for a leading technology solutions organisation who through our space planning service discovered that they required a range of workspace settings to accommodate the varied working styles of their teams. The new design included spaces for focused and private work, a social lounge designed to bring workers together, encourage social interaction and provide a space to relax and rejuvenate, and innovation meeting rooms with integrated technology so that teams can come together to collaborate, and generate new ideas. Our workplace survey enables us to capture the thoughts and feeling of everyone around the organisation, and involve employees at all levels, who previously may not have been able to express their thoughts. We ensure that all relevant feedback is considered and reflected within the design. In an increasingly competitive market place, attracting and retaining the most talented graduates and workers can be difficult for many businesses. additionally, potential candidates are seeking opportunities that provide a much more supportive, creative and innovative workspace as a pre-requisite during their job search, often prioritising over salary. A client contacted us recently as they were increasingly struggling to find spaces for their people to meet and complete collaborative tasks, they asked us to create more meeting spaces to overcome the problem. Upon visiting the space, we quickly realised that they already had a significant number of meeting spaces, they just weren’t designed correctly. When the space was initially created, the meeting rooms were set up to cater for groups of up to five participants – in reality each space was actually being occupied by single workers needing to complete focused work, or by pairs having a private meeting or conversation. Through our space planning service, we were able to identify and create alternative spaces within the existing building that could support individual workers and smaller groups, leaving the larger meeting spaces free for large collaborative group work.